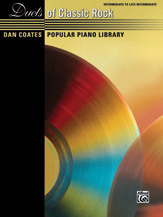 This collection features the music of legendary bands like The Beatles, Led Zeppelin, and The Rolling Stones in beautiful, entertaining duet arrangements for one piano, four hands. These selections are perfect for recitals, encores, piano ensemble classes, or just plain fun! Titles: Africa (Toto) * All My Love (Led Zeppelin) * From Me to You (The Beatles) * I Saw Her Standing There (The Beatles) * She's a Rainbow (The Rolling Stones) * Stairway to Heaven (Led Zeppelin) * Who Are You? (The Who) * Wish You Were Here (Pink Floyd).